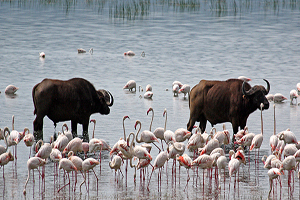 Lake Nakuru national park is just south of the town of Nakuru, under the protection of the Lake Nakuru National Park. Its proximity to Nairobi, about 164 kms, allows day tours and part of a circuit taking in the Maasai Mara or Lake Baringo and east to Samburu. The lake is famous for having the world’s greatest bird spectacle….myriads of pink flamingos; often more than a million or two at one time. They feed on the abundant algae, which thrives in the warm waters. As such, it is known as a “soda lake”. It is estimated that the flamingo population consumes about 250,000 kgs of algae per hectare of surface area per year. The abundance of algae, is created by the flamingo droppings. Photographs of the flamingos on Lake Nakuru are world famous. It is truly an amazing site, quite overwhelming to see the pink lake.. Besides the flamingos, there are two large fish-eating birds, the pelicans and cormorants, that are in large numbers at the lake. There are over 400 resident species of birds on Late Nakuru and its surrounding park. In addition, there are exotic mammals such as the 30 Eastern Black Rhinos, 70 White Rhinos, as well as large populations of giraffe and baboon. The Park also has many Maasai Lions, African Cheetahs and Tanzanian Leopards.